True to my word, I promised this recipe would find its way to you shortly after my Popcorn and Salted Cajeta Cake post so that you can try your hand at the cake… or maybe just make the caramel and eat it by the spoonful. Now, I made a pretty bold statement in that post, and that was that I thought Cajeta (pronounced cah-heh-tah) was even better than Dulce de Leche – I stand by that statement. 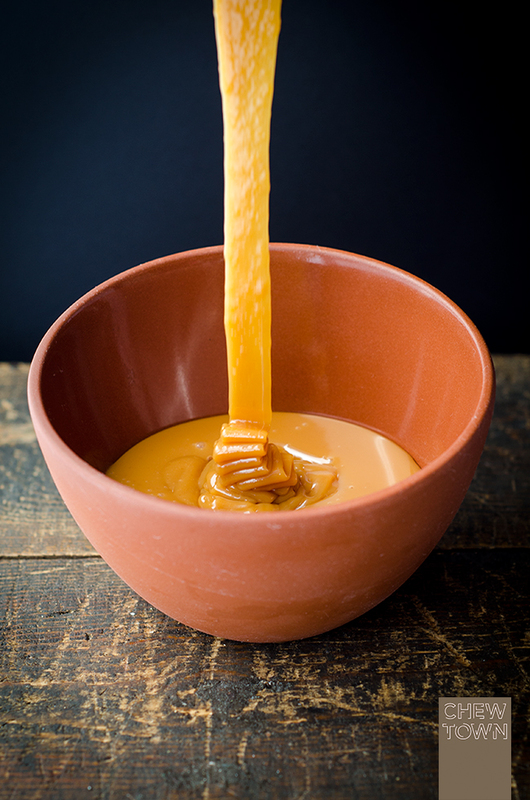 Cajeta and Dulce de Leche are very similar, but Cajeta differs from its relative in a distinct yet subtle way. They are both a milk based caramel made by thickening sweetened milk, but the primary difference is that the Mexican version is made from goats milk instead of cows milk. The goats milk adds a wonderful tang to the Cajeta that provides another dimension to the caramel while also mitigating the sweetness. Now, for all you goats milk haters out there, never fear, the flavour the goats milk adds isn’t the same as goats milk cheese – it is far more subtle. You see, Scotty hates goats milk cheese, but he really enjoyed the Cajeta. In Mexico you can often find Cajeta infused with vanilla, rum or even coffee liqueur which apparently makes it even more flavourful (methinks the coffee liqueur might be worth an experiment!). Into a large heavy sauce pan add goats milk, sugar, cinnamon, vanilla and salt, and heat over medium/high heat stirring until the sugar the sugar has dissolved and the mixture is lightly boiling. In a small bowl mix cows milk and bi-carb soda until the soda has dissolved. Remove saucepan from heat and pour in the baking soda mixture being sure to stir rapidly and taking care as the liquid will froth and bubble. Stir until the bubbles have stopped then return the saucepan to a medium heat and bring back to a simmer. Continue to cook stirring every 5 minutes until the mixture has thickened and turned into a thick sauce consistency. Continue simmering and stirring till the colour turns to a dark caramel and coats the back of a wooden spoon. The whole process should take between 40 minutes to 1 hour. The consistency you are looking for is that of maple syrup. Remove from heat, discard the cinnamon stick, and pour the caramel into a glass jar. Allow it to cool completely before transferring to the fridge where it will stay fresh for a few weeks. Yes! Cajeta is so much better than Dulce de Leche. It makes your whole house smell great. If you throw an extra cinnamon stick in there while cooking, it makes it even better. Loving this so much and your gorgeous pictures. i love dulce de leche, but i would like something less sweet. this sounds great! Spoonful for me. This looks terrific — thanks. This caramel looks awesome and I bet it can be dangerously addictive especially when paired with popcorn!! oh boy this is GLORIOUS! i want a simple vanilla sponge and a big jar of this cajeta! Recent Post: Nakd Water- Australia Launch Party @ Cafe Del Mar, Cockle Bay Wharf..
Woah. Looks like a Niagara Falls of caramel! If you say it’s better than Dulce de Leche, I gotta start making this!!!! Hahahahaha, I thought the hate of goat milk cheese was aimed at me, but nope, Scotty. Very curious on trying this liquid gold. Thank you for sharing the recipe! It looks beautiful. The color of this caramel is incredible! I have got to find some goat’s milk! How long did this last in a jar? I’m not sure it would even last long enough to get into that in my house! You are blowing my mind right now. That is awesome! Where did you get yours from? After seeing your Popcorn and Salted Cajeta Cake post I went to my local La Tiendita Mexican market and picked up some Cajeta. It was fantastic and now I want to try to make it myself. Thanks Amanda! So sweet. Perfect as a dessert. Where did you get the full cream cows milk? Is there any replacements? He Leni, it is just normal full cream milk from the supermarket. I just mentioned it was cows milk to differentiate it from the goats milk.